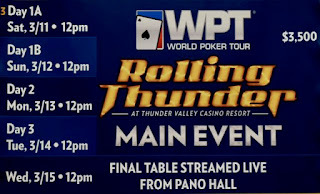 Play today's 5pm $90 step satellite as your first 'Step' to winning a Rolling Thunder Main Event seat. 1-in-5 entries in the StepSatty win a $385 Main Event multi-table satellite entry - and there's 10 seats guaranteed to a $385 in this 5pm StepSatty. The $385's award 1-in-10 entries a Main Event seat. See the FULL WPT SCHEDULE for all the $385 multi-table satellite dates.